Why my Sales Order turn into Receipts rather than Sales Invoice? Posted on June 21, 2011 | Comments Off on Why my Sales Order turn into Receipts rather than Sales Invoice? When processing Sales Order, user has two choices; you can either process it as a Sales Invoice or a Cash Sales transaction. 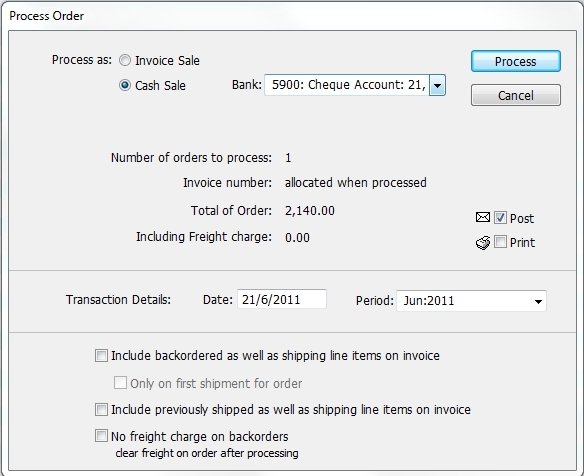 If you are processing the Sales Order as a Cash Sales, in the Process Order window, select ‘Cash Sales’ radio button. You need to select your bank account so to allow the money received in this cash sales transaction to be deposited. The double entry will be debiting Bank and crediting Sales account. The transaction type for Cash Sales will be a Receipts transaction and Sales Invoice is a Sales Invoice transaction type. Once the Sales Order is processed into either a Sales Invoice or a Cash Sales, the Sales Order transaction will be transferred to Sold in the Orders section of the Transactions Window. This entry was posted in MoneyWorks, MoneyWorks v6 and tagged MoneyWorks process order. Bookmark the permalink.